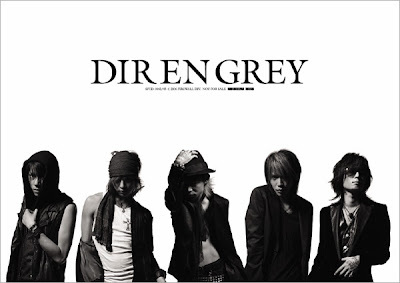 Our Asian Music Blog Recommendation for this week, Dir en Grey. Kyo's and Kaoru's names are usually written in Kanji. The names they are using are their stage names, not their real names. They have since released eight studio albums: Gauze (1999), Macabre (2000), Kisou (2002), Vulgar (2003), Withering to Death. (2005), The Marrow of a Bone (2007), Uroboros (2008) and Dum Spiro Spero (2011). Don't forget to check Amazon for Dire En Grey CDs and other Asian Bands. Three things identify the music of Dir En Grey: Kyo's vocal range, their veracity to experiment with different musical genre and their continuous noticeable sound and visual evolution. These are the reasons they deserve to be mentioned on this Asian Music Blog. Kyo is often compared to Mike Patton because of his ability to shift from singing to howling to growling to screeching to producing unidentifiable sounds in a snap. Like Patton, Kyo can also reach the lowest of the low and the highest of the high. However, Kyo has a cleaner sound and tone. His voice sounds whole and smooth that it's easy to imagine him singing pop songs because of the clarity and smoothness of his voice. His singing may also be considered "proper". Sans the screaming and screeching parts, when he sings, you can hear the sophistication of his delivery. It is this clarity that makes it the identifying mark of the band and also what sets him apart from other metal band vocalists. Many writers and critics refer to them as a progressive metal band. However, this classification is inspired by the fact that it is nearly impossible to classify their music under one genre. In the early years of their career, they appeared to be more alternative and experimental than anything. However, one or two of their songs in their albums would have a bit of a pop feel. By their third album, they started mixing metal with experimental. Often, they'd have more than one genre in one song. They even started mixing the western rock sound to their highly established Japanese rock sound. They continued combining and mixing different genres in one song until it became virtually impossible to put them under one classification. This also made them more marketable to the international market. They started out with heavy make ups and over the top clothes. Their visual style extends to their Music Videos. They videos are always intricate and tells a complete story. They have slowly shed the make up and the over the top clothes. Their recent appearances have showed them wearing simpler clothes and almost no makeup. Many think that this is due to two things: their age and their confidence and belief in the quality of their music enough to know that their music will stand even without the visual drama. The band has always taken pride of their refusal to ride on the usual marketing methods used by the Japanese Popular Music Labels. They don't make a lot of TV appearances and they don't give out a lot of interviews. This has allowed them to position themselves as an elite band that makes real music instead of being a product of marketing stunts. They are one of the few metal bands that is highly accepted in the Japanese mainstream market.